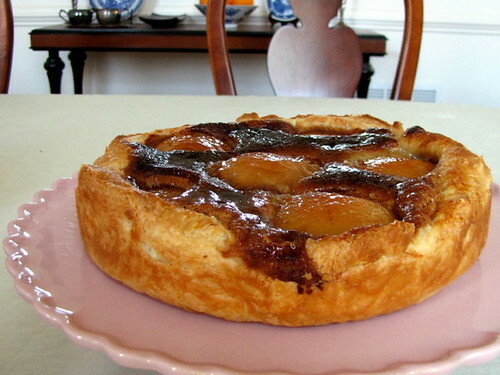 Red Anjou Pear Tart ~ I Can Do That! Pears are not a favorite of mine but once in a while when I see a really interesting recipe using red anjou or Starkrimson pears I get easily seduced. It is hard to resist this pear tart and I have to admit I have fallen head over heels in love after one bite. The tart has the right amount of sweetness, the spices are not overwhelming, and the tender but not mushy pears are not gritty at all. What a wonderful fall dessert and just perfect for this year's Thanksgiving dinner. Crust: Roll out pastry into a 12-inch round. Transfer pastry to a 10-inch springform pan, pressing pastry firmly onto bottom and 1 ½ inches up sides of pan. Cover with plastic film and freeze crust until firm, about 2 hours, or leave in the freezer overnight until ready to bake. Pears: Melt butter in heavy large skillet over low heat. Add sugar, spices, and salt. Scrape the seeds from vanilla bean; add bean and seeds to the skillet. Increase heat to medium-high and cook, stirring until sugar melts and turns brown, about 3 minutes. Reduce heat to medium; add pears, rounded side down. Cook until pears are almost tender, turning and moving skillet around occasionally for even cooking, 10 to 15 minutes, depending on ripeness of pears. With a rubber spatula, carefully turn pears over and continue to cook until pears are very tender, about 10 minutes longer. Remove skillet from heat. Let the pears cool in skillet with the spices. Filling: Melt butter in small saucepan over low heat. Scrape seeds and add to the skillet along with the bean. Add cinnamon, star anise, and cloves. Increase heat to medium; cook until butter is golden, about 3 minutes. Remove vanilla bean and spices from butter; discard. Whisk sugar, salt, and egg together in a medium bowl then whisk in flour. Gradually whisk in the browned butter into egg mixture. Bake the tart: Position rack in center of oven; preheat to 400°F. Brush frozen crust with beaten egg white. 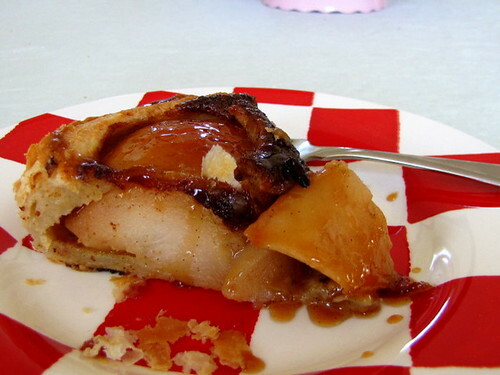 Pour filling into crust; spread evenly over bottom of crust. Using a slotted spatula, remove pears from skillet, allowing excess syrup to drain back into skillet; reserve syrup. 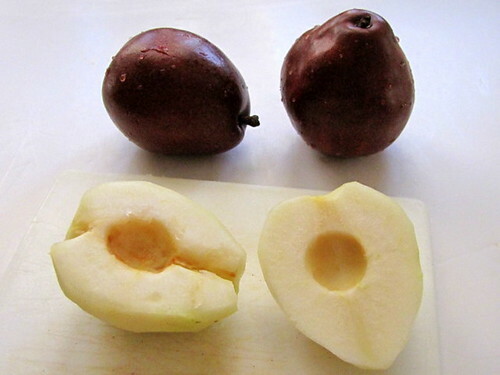 Arrange pears, rounded side up, atop filling. Bake for 1 hour or until crust is deep golden and filling is set and brown at the edges. Run a small knife around sides of pan to loosen the tart. Release pan sides. Transfer tart to a platter and let stand uncovered for a few minutes to cool slightly. To serve: Just before serving, boil syrup in skillet until reduced to about 1/3 cup, 1 to 2 minutes. Discard spices. Drizzle syrup over pears. Serve tart slightly warm. 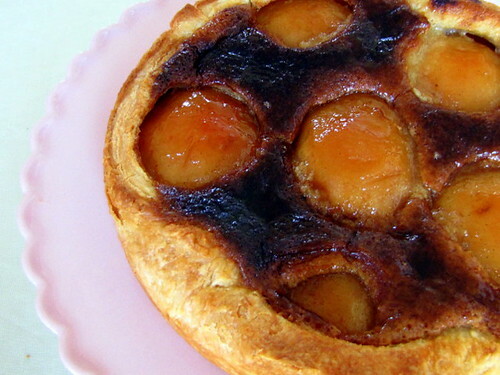 This reminds me of Michel Richard's egg pastry that is actually apricot halves on puff pastry with vanilla cream. I am sure your tart tastes as good. Delightful! i've been dreaming of this great pear frangipane tart i had in san francisco last month. it was quite possible one of the best desserts i've had in my life. Michelangelo in the Kitchen, oh I like your name. I've been meaning to make the "egg" pastry...fresh apricots are no longer in season...next year perhaps. Midge, I also made individual apple galettes with slices of apple topped with golden sugar and butter...simple but delicious. R, I'm lining up a few recipes for the quite large puff pastry I made last week. I will add apple and pear frangipane tart to my list. Good thing I still have almond paste in the fridge. You can use apples in place of pears, pareho lang siguro the taste.